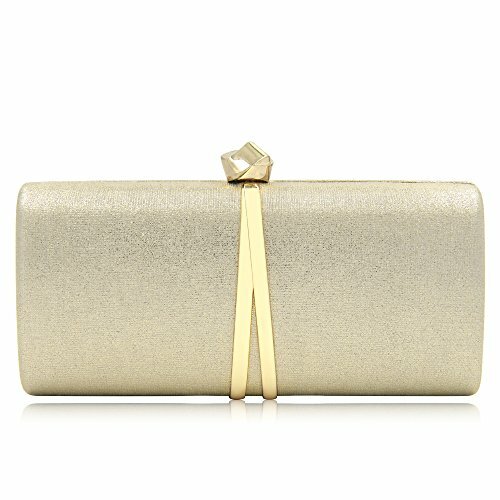 Women Bridal Metallic Evening Clutches Handbag Sparking Solid Clutch Purses (Gold) by Mystic River at Purse Outlet Coach. Hurry! Limited time offer. Offer valid only while supplies last. 【Trendy Design】Necktie style metal clasp(Easy To Open And Shut). Ribbon shaped shinning metal studded on the Evening clutches. Solid Glitter Embossing Fabric Covered on whole clutch evening bag. 【Detailed Description】Light Weight(0.77 LB) Can be used as a party wedding evening bag by hand with glitter effect. (Dimension)7.7length*1.6width*3.9height inches. It is comfortably and easily to hold it for all night long at prom,ceremony, banquet. 【Nice Capacity】 Interior lining is made of black satin. Interior Space is perfectly fitting in 5.5 inches screen's phone like IPHONE 8 PLUS, then thin and mini cosmetics, cards, car keys etc. 【Chain Strap】 Matches one strong metallic shoulder chain strap in 47 inches with removable hooks. Shoulder strap hooks attaches on the fixed position. You can wearing it on shoulder when hanging out or dating. 【Well Package】 Our clutches are well packaged with bubble wrap into white paper box (prevents item damaged on shipping easily). It is a great choice as gifts and presents for your female friends, co-worker or relatives on birthday, festival or anniversary.